Khvay Samnang has created several groups of works centred on development and human rights issues in Cambodia. Utilising video and photography, Khvay's 'Untitled' 2011 series exposed the controversial development projects around Phnom Penh, where thousands of residents were forcibly removed from their homes in low socio-economic areas. His 2014 'Rubber Man' works are the result of several trips to the rubber plantations in Cambodia's remote north-east province of Ratanakiri Province, and explore their effect on the local environment and indigenous communities. Khvay's photographs were shot in several locations and depict the artist pouring buckets of white rubber sap over his face and naked body, obscuring his features and masking his identity. 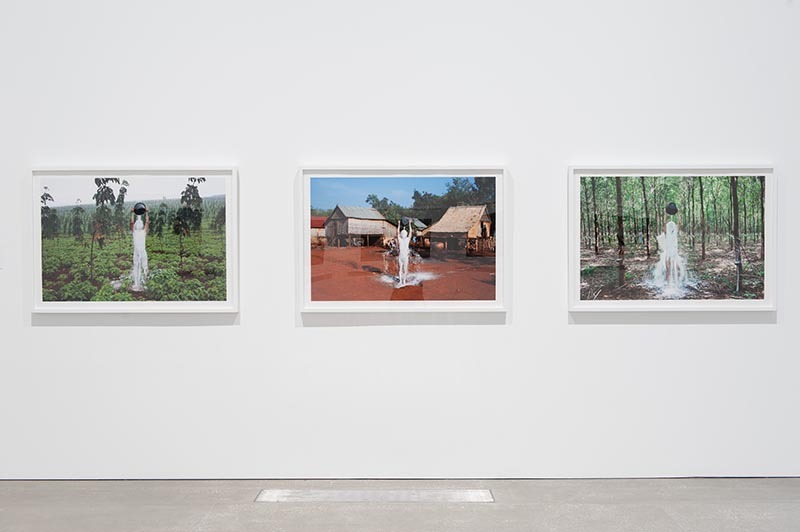 The series alludes to the recent and ongoing establishment of more than 300 000 hectares of foreign-owned rubber plantations, displacing local villagers and destroying the homes of communities and places of spiritual significance. Khvay Samnang, Cambodia b.1982 / Rubber Man 2014 / Inkjet print on Hahnemühle Photo Rag 308gsm paper, ed.1/3 / Rubber Man 2014 / Purchased 2015. Queensland Art Gallery | Gallery of Modern Art Foundation / Collection: Queensland Art Gallery / © The artist. Khvay Samnang's work installed in APT8.